Among the vegetables, I usually buy whenever I see them in market is corn (sweet corn). Though frozen corns are available in the supermarket all time, I prefer fresh corns over frozen corn. I got a pack of fresh sweet corn kernels from the vegetable shop last week. 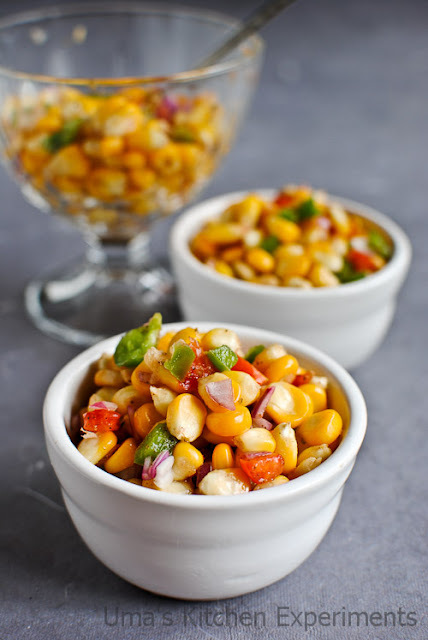 Though there are ‘n’ number of recipes one can prepare using it, I simply go with the preparation of butter corn with chat masala or masala corn with spicy red chilli powder. 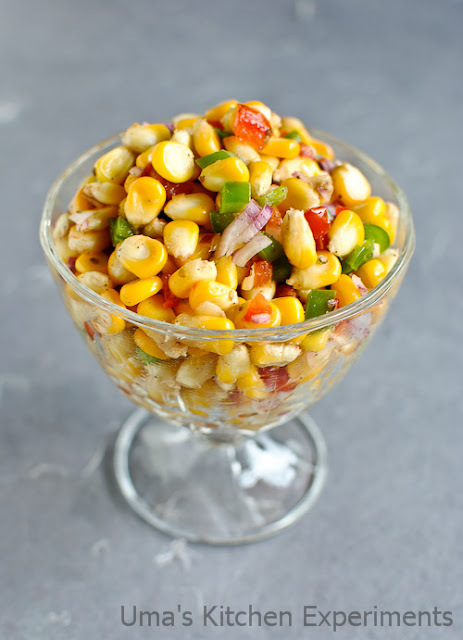 This time, I wanted to prepare Esquites style corn salad but ended up in preparing this simple, easy Mexican corn salad in a short time. To my delight this dish was consumed immediately by my family members who liked the taste it and loved the aroma of oregano. 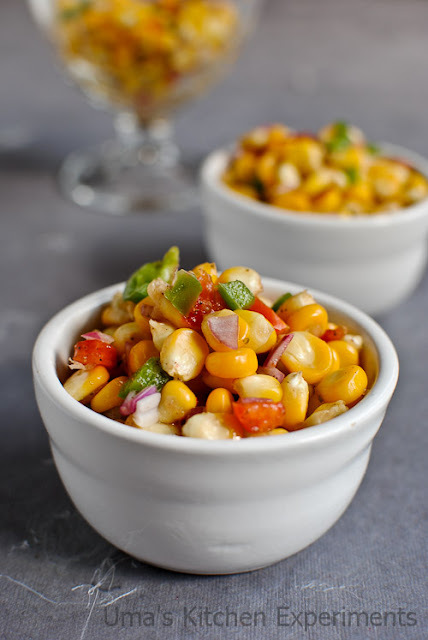 1) Wash the fresh sweet corn kernels and steam it for 5-7 minutes. You can also place the sweet corns in a microwave safe bowl with water to cover the sweet corns and microwave it for 7-10 minutes until it becomes soft and well cooked. The time might vary depending on the type & power output of microwave. Once cooked, transfer the sweet corns to the small mixing bowl. 2) Finally chop onion and green capsicum. Remove the seeds from the tomato and chop it finely. 3) Add all the chopped ingredients to the sweet corns. 4) Add lemon juice, oregano, pepper powder and salt. Mix well. 5) Taste and adjust the seasoning. Serve it warm. 1) You can also add red bell pepper and red chilli powder to this salad. 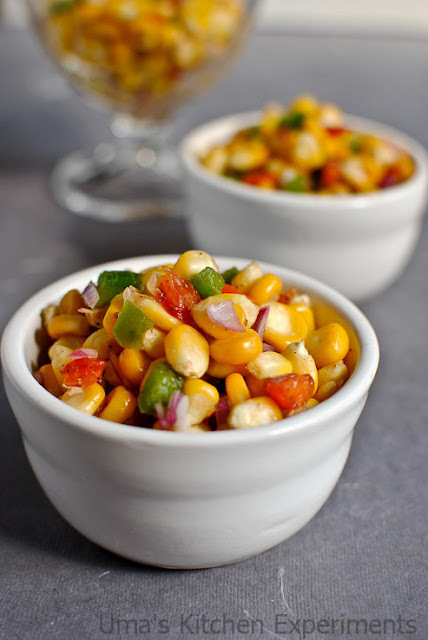 2) You can also use frozen sweet corns for making this salad. Catchy and colourful salad, have to make some soon. Corn Salad is looking very colourful and very eye catchy. I too make this often..yummy and colorful salad.. Salad looks so delicious and mouthwatering. Thanks for posting this healthy salad. I made this salad oftenly as our evening snacks....it is too tasty and healthy. Wow, I love everything in this corn salad! And beautiful pics! thats a yummy looking salad and with those ingredients it just cannot go wrong! 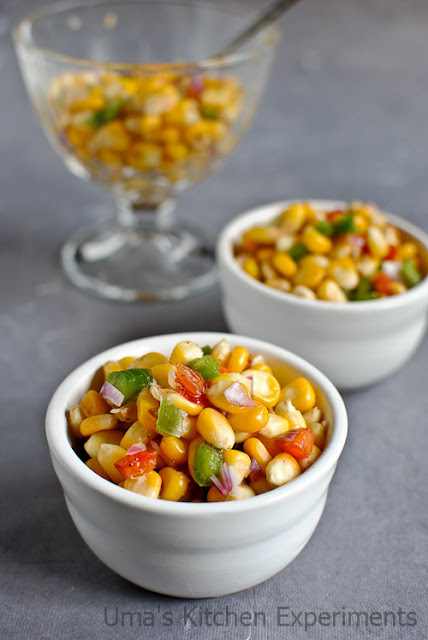 I love this, made one today again with sweet corn.., simply colourful and such inviting clicks..